Article originally published in Adweek on October 8th, 2018. So far in terms of mobile content, the quality, diversity and engagement have been skillfully mastered and integrated into user experiences. But this soft excellence has to be matched with similar prowess in quality of the hardware production. For instance, music is becoming an increasingly important element in the smartphone-based customer experiences. Instagram recently announced that their Stories feature will allow users to add music into their photos and videos. That’s a billion users worldwide receiving audible information whenever they want, not to mention the burst of popularity in other smartphone-fueled mediums, like podcasts and audiobooks, all over the globe. 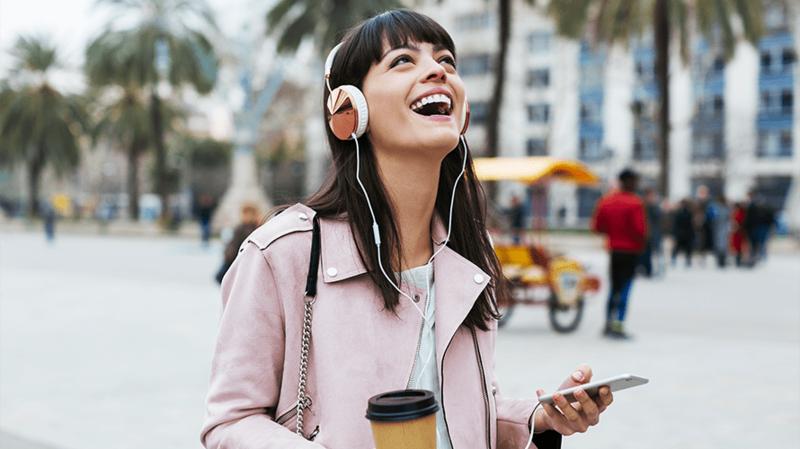 Audio is playing a more important role on one of the most influential marketing platforms in the modern world because mobile is making audio consumption possible even when the screens are off. Smartphones have opened the playing field for the consumption of audio, as 53 percent of Americans are streaming audio weekly. As marketers are learning that the quality of audio affects the credibility of the content, the latest mobile trends are turning the negligence of audio production quality from harmless matchstick games into playing with fire. Meanwhile, newly emerging phones aren’t creating similar buzz as they did back when higher megapixel cameras were first introduced to the markets. Where camera technology and consumer provocation through higher resolution images once lifted smartphone sales to an all-time high, could audio hardware inherit a similar role as a sales attraction? Nokia seems to think so. The quality of audio will need to match the hardware specs the same way as 1080p and, more recently, 4K have done with screens. As the mobile phone speakers upgrade and the impending arms race for kilohertz (kHz) and bits kickstarts, the expectations for good quality will rise linearly. The quality of audio will need to match the hardware specs the same way as 1080p and, more recently, 4K have done with screens. More importantly, audio and video are an unbeatable couple in terms of driving interaction with content. The quality gap, either in terms of content or production, shouldn’t be allowed to grow too wide between these symbiotic mediums. Not just any piece of audio will work in bridging that gap. The audio that thrives in the new ball game has to be customized both in quality and content. Custom-made audio allows brands to control the production quality from start to finish because they will be working directly with the composers rather than downloading a library track for a standard price. Choosing the stock music option would be like searching for a five-star gourmet meal from the frozen food section of your local supermarket. Using custom audio content empowers you to match the exact goals of your marketing communications, and the end product will always be equal to the rising quality standards of the future. Custom productions offer a chance to improve the durability of the audio over time. This is especially valid in the mobile environment for product sounds on SaaS, games and life enhancement apps. For sounds that have a lot of wear and tear and are heard a lot by end users, it is important that the audio used has a high degree of replay value. Having professionals stress test your product sounds can go a long way to ensuring product satisfaction. The only way to tweak and perfect these product sounds is by using custom audio and not a stock library option, which are static, uneditable and fixed. Besides stress testing, custom audio allows brands to inspect whether the music fits the purpose or just matches the producer’s personal preference. It is very hard to be objective with something as subjective as music. Custom music can be tailored to fit exactly the tone and the mood of visuals and the brand, more than the personal preferences of the product manager or production company intern in charge of selecting the music. By putting a little more thought into the music, the overall resonance of the marketing message increases dramatically. Just like visual brand guidelines include predestined color codes and pixel dimensions, your brand book should encompass dimensions for the use of audio, too. For example, high-resolution audio files have the bit depth (the sensation of space in the overall sound) set at 24-bit and the sampling rate (the resolution of the sound) of the audio at 44.1 kHz. In layman’s terms, we’re talking about audio that can produce a full sound in large speaker playback. Since we have been able to squeeze video cameras into our smartphones in the past, we can expect our home stereos to fit in there as well. Respectively, voice-first touchpoints like podcasts require the designation of professional microphones and Dictaphones. As mobile brands both in software and hardware industries start investing in audio, content producers will have to jump into the moving train and match the hi-tech framework with equally top-notch productions. Otherwise, the love affair between audio and visual turns into a hateful one, as the erratic quality ultimately reflects badly on the brand.